CAT DI LR section has become increasingly tough beginning from 2015. However, Understanding the basics of Bar graphs, Pie Charts, Multiple graphs, Line Graphs etc forms an integral part of solving tougher CAT level DI LR questions for the CAT Exam. This question is from Logical Reasoning for CAT - Grid Puzzles. 5 teams A, B, C, D, and E participate in a tournament where they have to perform 5 embarrassing tasks like preparing for CAT and XAT. The tasks are numbered from 1 to 5. 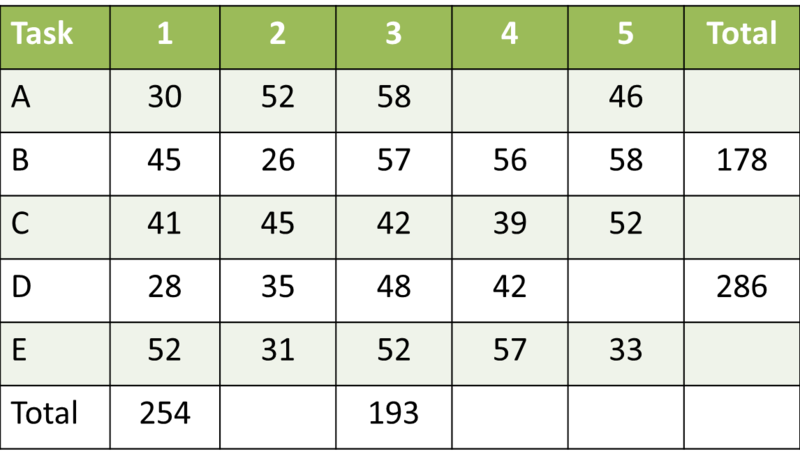 Each tasks has an interesting points’ scheme – the team finishing the task first receives 50 points, the team finishing second receives 40 points, third one gets 30 points, 4th placed team receives 20 points and the one that finishes last receives 10 points. If a team does not finish the task in the stipulated 60 minutes, it gets 0 points. Further, for every minute ‘saved’, a team gets an additional point. 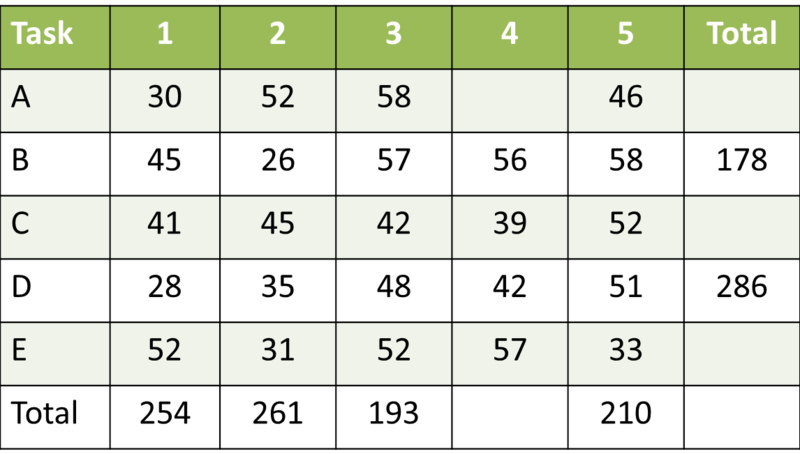 As in, if a team finishes second and finishes the task in 53 minutes, the team will get 40 + 7 = 47 points. Thankfully, all teams finished all tasks within the stipulated 60 minutes. The times taken by the teams to finish the tasks are given in the table provided below, with some numbers being omitted. We know that team D won the overall championship with an overall score of 286 points, while team B ended last with an overall score of 178 points. It is known that a total of 254 points were scored in game 1. 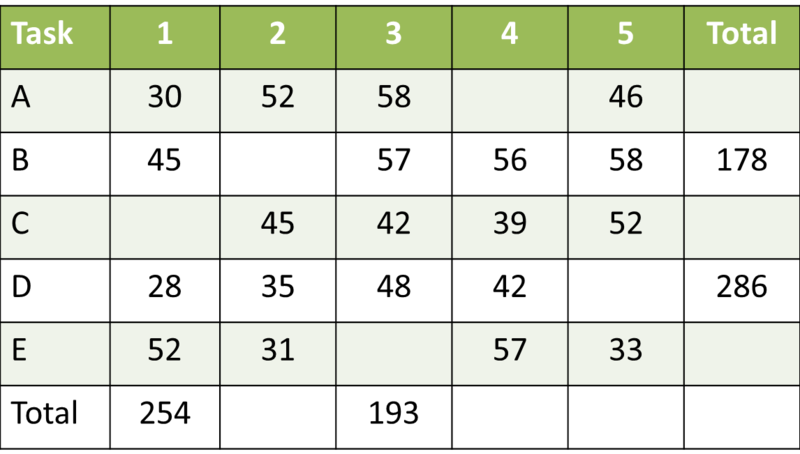 Game 3 was the toughest where only a total number of 193 points were scored. Total number of points scored is 1126. Let us start with the table outline first. ow, points are given on two bases – 1) The position in the finish line. And 2) Minutes remaining. We need to carefully account for both to get to the overall points tally. The best places to start are for the totals for the games. The statement “Thankfully, all teams finished all tasks within the stipulated 60 minutes ” is very useful. This tells us that for each game the total points given on the basis of position of finish is 50 + 40 + 30 + 20 + 10 = 150. So, now let us look at game 1. 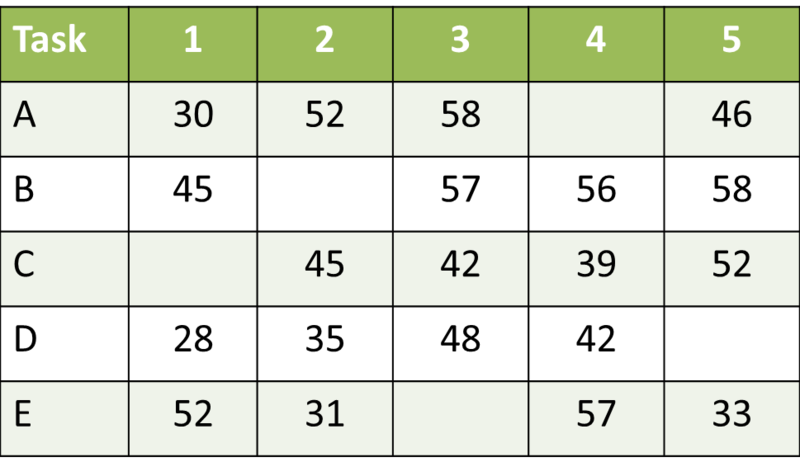 The minutes ‘saved’ by A is 30, by B is 15, by D is 32 and by E is 8. These add up to 85. The total points on game 1 is equal to 254. 150 come from the points given to winning positions. 85 from minutes saved from the 4 players A, B, D and E. So, 19 points should have arisen from minutes saved by C. Or, C should have taken 41 minutes to commit his task. We can follow the same process for game 3. The minutes saved by A, B, C and D are respectively 2, 3, 18 and 12 adding up to 35. Points from the positions idea amount to 150. Total points = 185. We have 8 points unaccounted. This should have come from minutes saved by E. Or, E should have completed his task in 52 minutes. Now, let us move to the totals for player B and player D. Let us start with player B. Again, let us compute points taken for positions and for minutes saved. We know that B finished 4th in game 1 and game 3. But we do not know the same input for game 2, 4 and 5. For game 2 we have no information, but for games 4 and 5 we know something. In game 4, B has to have finished 3rd or 4th. C and D are ahead of him and E is behind him. SO, he should have got either 20 or 30 points. Similarly, in game 5, B should have finished 4th or 5th. A, C and E are ahead of him. So, on the basis of the positions B should have got 70, 80 or 90 points from these 4 games. 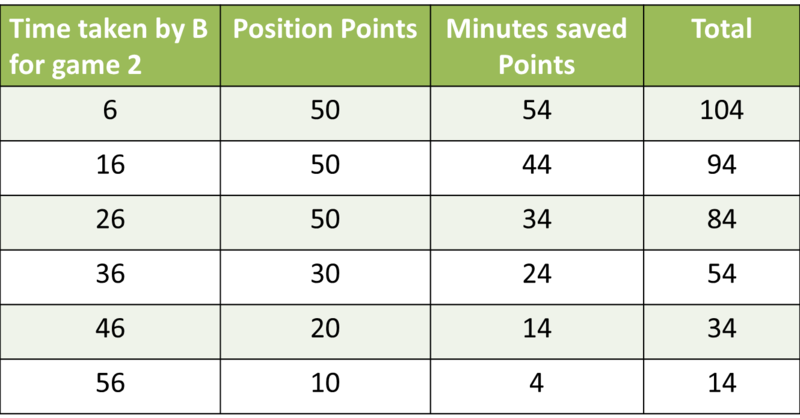 On the basis of minutes saved, B should have got 24 points from these 4 games. Totally, B should have obtained 94, 104 or 114 points from these 4 games. So, from game 2 B should have got 64, 74 or 84 points. In game 2 also, he will get points for minutes saved and for position. Let us forget the position for the time being. On the basis of minutes saved, he should get a number of points that ends in 4. Or, he should have taken 6, 16, 26, 36, 46 or 56 minutes to finish the game. Now, we are down to trial and error. If B finished in 6, 16 or 26 minutes, he would finish 1st. If he finishes in 36 he would be 3rd, if he finishes in 46, he would be 4th and if he finishes in 56 he would be last. Now, let us rejig the table and see if we can do the same process for D also. D finishes 1st in game 1, 3rd in game 2 and 2nd in game 3. This we know for sure. D could have finished 3rd or 4th in game 4. So, on the basis of positions secured D should end with 150 or 160 points from the first 4 games. On the basis of minutes saved, D wins 32, 25, 12 and 18 pints in the first 4 games amounting to a total of 87 points. So, the total points from first 4 games is 237 or 247. So, points won from the last game should be 49 or 39. So, time taken to finish the game should end in 1. D could have finished in 1, 11, 21, 31, 41 or 51 minutes. 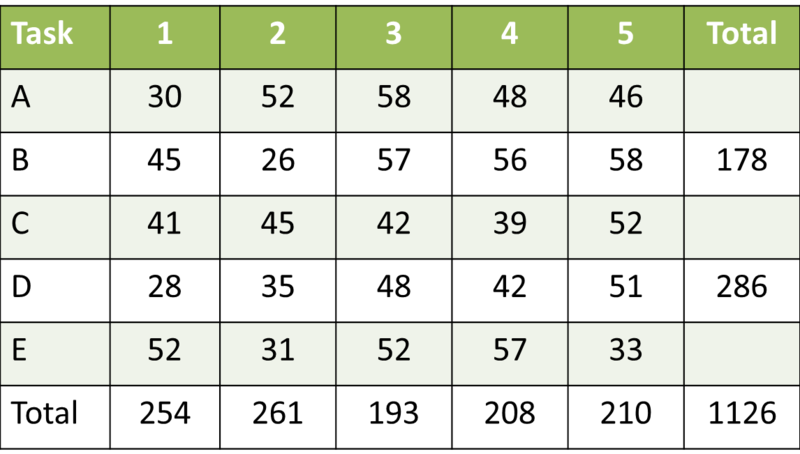 However, keeping in mind that D won a maximum of 49 points, we can eliminate 1 and 11 straightaway. Or, D should have taken 51 minutes for game 5. Now, we have everything except one box in the grid. Now, the total points scored is 1126. We can figure out the points scored in every game from this and then figure out how long A took to finish game 4. Game 4 minutes saved add up to 4 + 21 + 18 + 3 = 46. Total points scored from positions = 150. So, points due to minutes saved by A = 208 – 196 = 12. Or, A should have taken 48 minutes for game 4. With the completed table, we can answer all the questions. Question 1: How many minutes does C take for game 1? 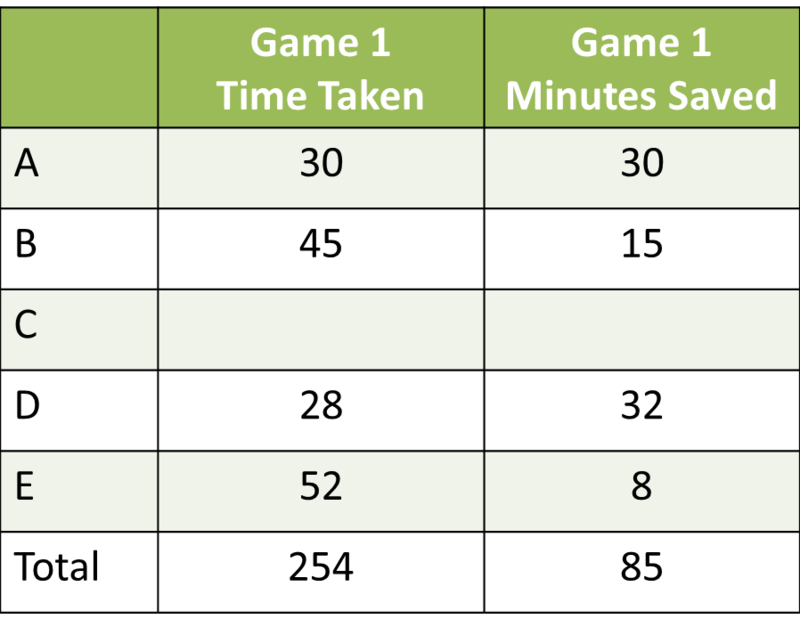 Question 2: How many minutes does A take for game 4? Question 3: How many minutes does B take for game 2? Question 4: How many minutes does D take for game 5? 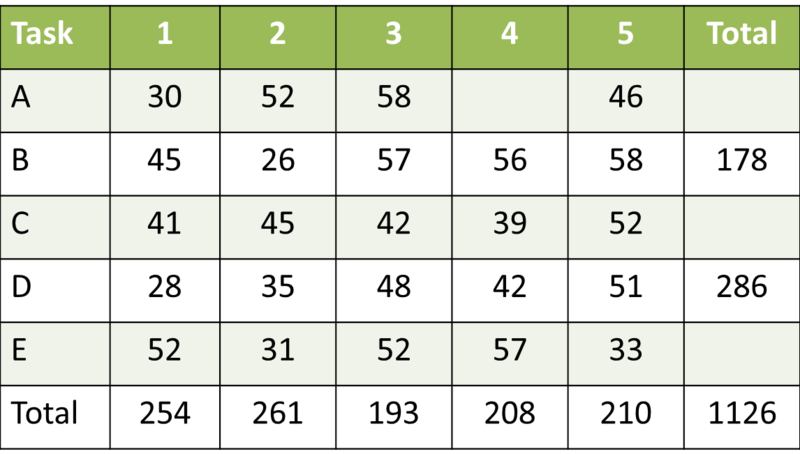 Question 5: What is the total number of points scored by A?